Totally Tattoo Body Paints are the newest, wildest art form! 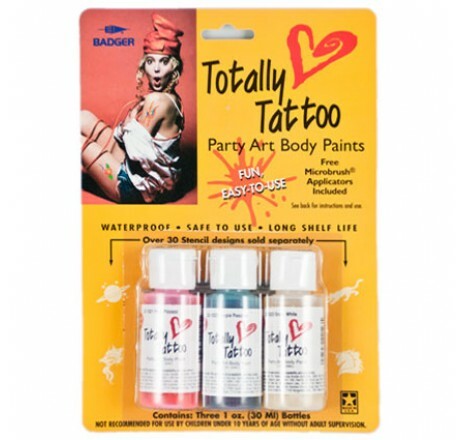 Badger Airbrush Totally Tattoo paints are waterproof, safe to use and non-toxic. 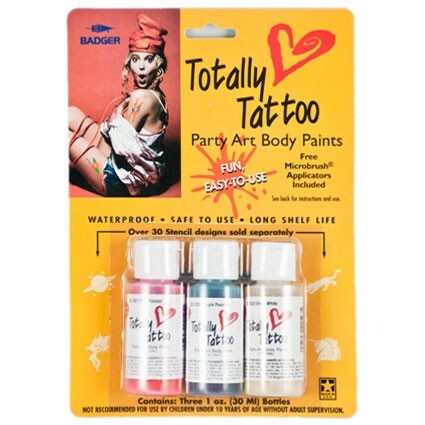 Totally Tattoo Body Paints can last 24-72 hours when applied with an airbrush on properly prepared skin (for the best adhesion and longer lasting results cleanse skin with isopropyl alcohol prior to spraying Totally Tattoo). Alcohol based for extended durability, Totally Tattoo is easily removed with isopropyl alcohol. 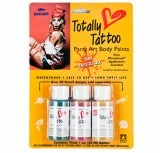 Totally Tattoo Body Paint can also be applied with an artist brush or mini paint applicators.